Musicians are interested in, even obsessed with, sound. Thus it seems paradoxical that musicians are typically not very interested in audio. But in my experience, musicians are fascinated with audio if it sounds right. The trouble is that most audio systems sound fundamentally wrong. This is because most audio systems have a big hole in the frequency range just below middle C, and to someone who listens to sound as music, not in audio categories, this is a fatal flaw. Middle C on the piano is 261.6Hz. Middle C is the natural dividing line between the upper and lower ranges of music, the boundary in particular between the treble clef and the bass clef. Pick up a hymnbook or any other place where four-part vocal harmony is written. The basses and the tenors are in the bass clef, the altos and sopranos in the treble. Similarly, the left hand of the piano usually plays the notes below middle C and the right hand those above. Of course, the ranges overlap. Still, closely enough, half of music is below middle C, half is above. But a startling percentage of the speaker/room combinations in the real world have a big hole in the range below middle C. This is far more common than not. Somewhere between 100 and 300Hz, there is typically a deep and quite wide trough in the in-room frequency response. The problem is not primarily the speakers' anechoic response, but the speakers' not being designed to interact with the floor correctly. Some of the designers who presumably cannot figure out how to deal with this contend that it is not a problem and that floor bounce is a natural thing. This is nonsense. The natural floor interaction of the original event is already recorded, and whatever floor interaction a system adds, if it does, is spurious — and musically devastating. I am not speculating about the existence of this dip. It is easily audible and it is easily measured. And in this frequency range, what is measured is what is heard. And you can find many more examples any place where in-room response measurements are available. 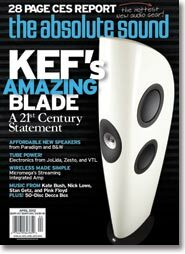 There is a good reason why Martin Colloms in HiFi News used to call this dip "the usual floor dip" — it really is usual, especially for floorstanders. It is also enormously destructive to music. If energy is lost in the octave below middle C, concert grand pianos turn into spinets and the cello section goes out to the lobby. And the harmonic foundations of music are undermined, and much of its power and grandeur and beauty is destroyed. In addition, because deep bass instruments are heard in good part through their harmonics, the deep bass also loses perceived energy, compounding the damage. Having the right balance through this lower midrange and upper bass region makes all the difference. The world is all too full of speakers that sound thin and tinny because of that floor dip. It is easy enough to discover if your system suffers from this problem. If you do not trust your ears — and you might be too used to this wrong sound to react to it as strongly as it deserves — just try measuring with test tones and an SPL meter. A rough measurement, but it will do the job because the effect involved is large, typically 3 to 5dB or more. I have done a lot of DSP room/speaker measurement and correction of a great many systems over more than fifteen years. Take it from me, by far the most common and most troubling problem of speakers in rooms is precisely that the crucial octave-and-a-half below middle C is down in level in part or entirely. Applying the appropriate correction makes a truly major difference to music. No subtle matter here. With the correction, there is real music. Without it, there is a thin, tinny imitation. This lack of energy below middle C is typically the biggest error in listening terms that room/speaker combinations make. And it ruins music. If you want your system to sound like music, look for speakers that interact with the floor correctly, and also experiment with DSP room correction. Getting rid of the usual floor dip makes all the difference. It really does.